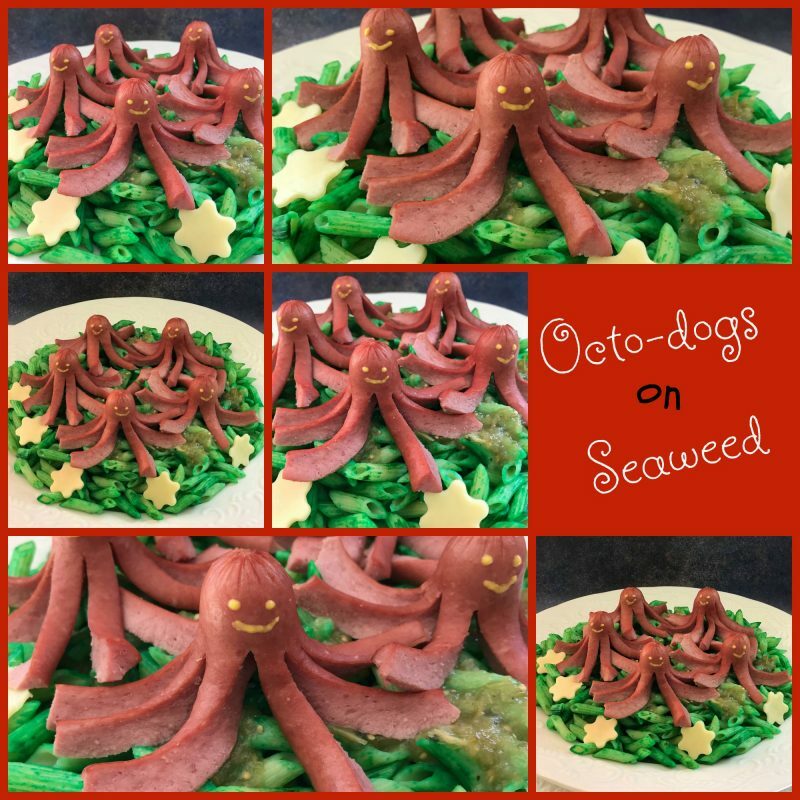 I first saw this recipe for Octo-dogs on Seaweed many years ago in a Taste of Home recipe book. By that time my kids were in High School and weren’t really into hot dogs and cute kiddie meals anymore, obviously, so I knew this project would have to be put on hold for a few years, along with a few other fun filled, cute, kiddie projects I always wanted to make. Well the time has finally come to dig out all the fun filled, cute kiddie food projects that I’ve saved over the years. Now that I have grand-kids, ages 3, 5, and 7, I can take advantage of my saved culinary kiddie projects, many of which I’ve all ready subjected them too. Some have been huge hits and others total fails but all have been made with love. Thank God my grand-kids and kids love rice krispies treats because when all else fails, make “whiskey” treats as my 5 year old grand-daughter would say. One project in particular, Swedish fish swimming in blue raspberry jello made in a small glass fish bowl, was a total bomb and not in a good way. When you want an honest answer, ask a kid. Seriously, they’ll tell you the truth every time. 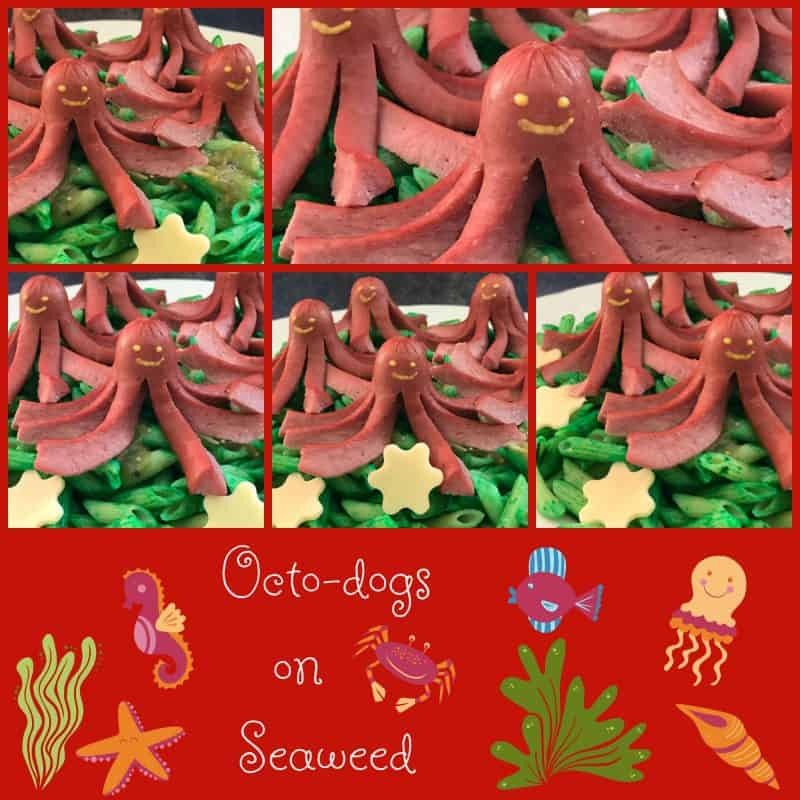 When my grandson stayed with us recently, I made him these Octo-dogs on Seaweed. He said he “loved them” but I knew something wasn’t right. So I asked him again, “So what do you really think about the Octo-dogs on Seaweed?” After he went into a ten minute “recipe review,” he basically said he liked the Octo-dogs but not the Seaweed and I concur. With all of the flavors of pasta and noodles on the market today, I don’t know what I was thinking, (I guess I wasn’t thinking) when I served these cute Octo-dogs sitting on top of cooked, mini penne pasta, colored green with food coloring and then tossed with green salsa! I must have been sitting in the sun too long that day because now that I write that, it sounds so bad I’m actually laughing! Now that I’ve stopped laughing, lets get on with it. As I was saying, with all of the fantastic brands of flavored pastas on the market today, these cute Octo-dogs would look perfect sitting on top of a bed of Spinach Fettuccine or Spaghetti. My two favorite brands of dried pasta are Al Dente Artisanal Pasta and Mrs. Miller’s Homemade Noodles. I can find both brands anywhere in my area but if you can’t, use whatever is available to you. You’re shore to get wave reviews when you serve these fun hot dogs! In a saucepan bring 4 to 6 quarts of water to a boil. Add salt to taste. Add pasta to boiling water, for authentic “al dente” pasta, boil 7 minutes, stirring occasionally. Drain well. Set aside and keep warm. Meanwhile, fill a second sauce pan with water. Cut each hot dog lengthwise into eight strips, leaving a 2-inch “head” at one end. Drop dogs into boiling water, 3 at a time; cook for a few minutes or until heated through and “legs have curled up. Remove with a slotted spoon to a serving plate. Repeat with remaining hot dogs. Place pasta on serving platter. Add eyes and a smile to your hot dogs with yellow mustard using a toothpick. Place on top of pasta. Cut out shapes of sliced cheese and garnish. Still Hungry? Make these fun and delicious recipes. Homemade Corn Dogs, Mini Cheesy Dogs and Sensational Summer Salads.